The Himalayan cat is a breed of our own making; a cross between the puffy Persian and the social Siamese. This kitty is the best of both worlds, and while most official cat associations do not recognise it as a distinct breed, when have cats ever played by the rules? That’s right, never. Let us paint you a picture of the Himalayan cat. The gorgeous Persian is the canvas - the same stocky body, broad head, and small nose and ears. The face may be the flat shape favoured by some breeders, but we hope it is a more traditional shape - a flat face can cause a lot of health problems for your cat, and I’m sure your Himmy will agree that good looks aren’t worth suffering for. The canvas also has the Persian’s long coat and fluffy tail. Now, the paint, sourced from the Siamese, applied in the same handsome pointed pattern. The points may be seal, blue, lilac, chocolate, red or cream ( and patterned tabby, lynx or tortoiseshell). Finally, the gorgeous blue Siamese eyes. Voila! The finished product! Like its appearance, the Himalayan cat takes its personality from the Persian and Siamese. This cat is generally docile and low-key, happy to nap in its comfy bed. It is affectionate, but discriminating, picking a favourite human servant for its daily pats. Like the Persian, it is not overly fond of energetic children or dogs, and doesn’t appreciate a noisy environment. That said, like the Siamese, the Himalayan cat will happily produce plenty of its own noise, and loves having a yarn. It is, as a rule more active than the Persian, and will appreciate having a steady supply of new toys to challenge both body and mind. The Himalayan cat needs daily brushing, and don’t forget the dental care and usual grooming that will keep your cat happy and healthy. Your Himmy’s splendid coat will also need the occasional bath. Make grooming part of your daily routine and both you and your cat will appreciate the bonding time. A couple of treats before and after certainly won’t go amiss, although be careful as the Himmy is prone to putting on the pounds - your cat shouldn’t weigh more than 5.5kg. Finally, this supremely fluffy kitty needs a well-maintained and spacious litter box to keep its fur looking lovely. 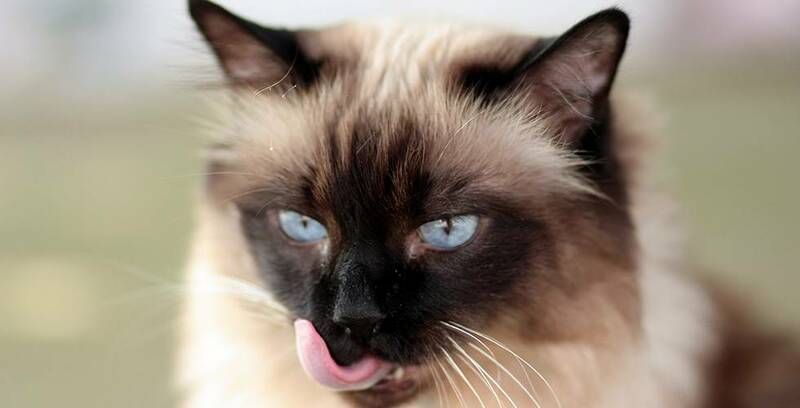 The flat face of some Himalayan cats can cause health problems, including: difficulty eating, difficulty breathing, overflow of tear ducts, dental problems and entropion (where the eyelids turn inwards, rubbing against the eye and causing pain and cornea damage). This breed is also more susceptible to polycistic kidney disease, leading to excessive drinking, urination, reduced appetite, weight loss and depression. Although a responsible breeder will screen for this condition, take your cat to the vet if it has any of these symptoms. Hypertrophic cardiomyopathy is also hereditary in this breed and you should maintain regular check-ups. However, note that the risk of disease is nowhere near a certainty: a well-looked after Himalayan will be a loving companion for 12 to 17 years. If you suffer from allergies, look at some other cat breeds before your nose faucet opens. Trust us, your Himmy won’t like being covered in snot either. If you still need convincing, let us help you fall in love with the Himmy; or maybe you want a more kid-friendly kitty? It’s okay, we won’t judge. Find the cat that’s right for you here.